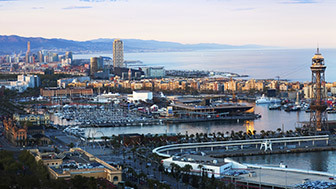 Barcelona has an excellent public transport system that interconnects all of the city's districts and provides links with towns in the metropolitan area. There are also alternative and period forms of transport that provide you with a different view of the city. 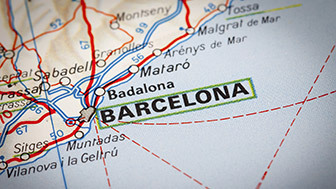 Sustainable transport, such as bicycles and electric cars, are another notable feature: Barcelona has nearly 200 kilometres of clearly signposted and protected bicycle lanes. 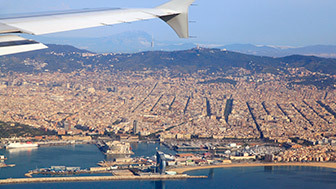 Thanks to its Mediterranean climate, Barcelona is a place where people can enjoy the outdoors all year. And the city is also accessible on foot: there are sizeable pedestrian areas in every district that are ideal for a stroll, where you can let your curiosity lead you to new discoveries. And if you want to get the most out of your walk, you can always follow one of the itineraries that cover the city's emblematic places, or just soak up the charm. Barcelona has an excellent public transport system: eight metro lines interconnect all the city's districts and part of the metropolitan area, two tram lines cross the city from north to south, a large fleet of buses reach every corner of the city, and local trains complement the metro network. Furthermore, the city's public transport uses an integrated-fare system, which allows you to use various means of transport with just one ticket. Clean and sustainable, bicycles are a fantastic alternative for moving around a city that provides optimum conditions for cyclists, with a network of nearly 200 kms of bicycle lanes, connecting the city from north to south and from east to west. There are various bicycle-hire companies operating in Barcelona and organised tours are available as well. Outside the city centre, there is also the chance to try mountain biking, both in Collserola Park and on Montjuïc. Barcelona is served by a fleet of eleven thousand taxis. Their yellow and black colouring make them unmistakable. You can get one at various taxi ranks situated in the city's busiest places and you can flag one down in the street, if its roof light is green (meaning it is available), just by raising your arm. They can also be booked online or by phone. The fares vary, depending on the day and time. Committed to the environment and the fight against climate change, Barcelona has made a firm commitment to sustainable transport. Proof of this is its LIVE platform, an acronym for Logistics for the Implementation of Electric Vehicles. The platform was set up with the aim of promoting the introduction of electric mobility in the city and its metropolitan area. An electric Barcelona will soon become a reality. Barcelona has several unique forms of transport, traditional and modern, that offer a really original view of the city cable car takes people to the top of the mountain from the port while the Tramvia Blau, or Blue Tram, which goes up to Tibidabo, is the oldest tram in Barcelona, and the Golondrina pleasure boats are a traditional attraction that give you a view of the seafront from the sea.